Cross the threshold of this graceful 1886 Queen Anne Victorian mansion and return to the elegance of the 1880's. Blue Violet Mansion is situated on a quiet street with an acre of private gardens, swimming pool and spa in historic Old Town Napa and within walking distance to downtown shops and restaurants. Described by Bill Gleason in his book, The 50 Most Romantic Places in Northern California, as"..the cabernet of Napa Valley's inns," it is the winner of the prestigious Landmarks Preservation Award of Excellence for Historical Restoration in 1993 and received the Gold Award for Best Bed and Breakfast in North America in 1996 by the Official Hotel Guide published by the Reed Travel Group. 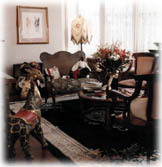 This lovingly restored inn is an intimate and enticing home, as innkeepers, Bob and Kathy pride themselves in catering to the romantic at heart. Their rooms are decorated with taste and flair, each one different from the other. All guest rooms have designer bathrobes, hair dryers, iron, ironing board, reading materials, (including books to fit the decor), candles, candy dish, clock radio and more. The rooms are elegant and peaceful. All guest rooms have telephones with voice mail and modem outlets. Televisions and VCR's are available for rental on request. The two front guest rooms have private access to the 50' foot balcony that spans the front of the mansion. Other guest accommodations include large, cheerful rooms, fireplaces, and private bath rooms with claw foot tubs, whirlpool spas or showers built for two. Guests are encouraged to feel at home in the grand front parlors and enjoy the rose garden, gazebo with swing, swimming pool, outdoor spa and gardens. For those special occasions you may choose to be a guest on the Inn's newly opened Camelot Theme Floor with fully handpainted rooms accented with stained glass and complimented with deluxe ammenities, linens and crystal and silver throughout. Enjoy an evening of romantic elegance with a private candlelight dinner served in your room or reserve one of the elegant tables in Violette's at the Mansion, the new dining and entertainment facility in the Mansion's grand salon, serving fine French and Mediterranean cuisine. If you are traveling with friends, you may reserve the dining room for your guests and play the role of lord and lady of the mansion for the evening. For that special romantic getaway, in-room massage services for two, flowers and gift services are available. The Camelot Theme Floor even improves upon the previously mentioned amenities bringing your stay to a superior level in unique theme rooms, which include French lighted mirrors in the bathrooms, two-person whirlpool spas, deluxe linens, silver and crystal glasses and goblets and corner gas-burning fireplaces. This floor is enhanced with hand-painted murals and stained glass windows and skylights to resemble a castle courtyard and regal rooms. A full 2-course country breakfast is served each morning. Fresh fruits and juices, quiches, pancakes and waffles, French toast, special morning breads and cakes are some of the standards on a daily changing menu. Fresh coffee and teas are available each morning and hot beverage makings with dessert are available throughout the afternoon and evening. Wine, champagnes, and food trays or 5-course candlelight dinners in your room can be arranged on request. The Blue Violet Mansion caters to your every need with an array of services. The Napa Valley abounds with recreational activities including hot air ballooning, gourmet dining, antiquing, horse back riding, fishing, hiking, bicycling, wine tasting, brandy sniffing and weekend activities such as arts and craft fairs and various competitions. The Blue Violet Mansion is 10 blocks from the famous Napa Valley Wine Train. A hot air balloon company, with a basket for four, will pick up guests at the Mansion and return them back in time for breakfast. Van and limousine services are available for touring the valley, as well as old-fashioned touring cars with chauffeurs. A short drive by car to the Ferry Terminal in Vallejo will offer an additional day long outing in San Francisco or one of the islands in the Bay!